Kazakhstan's capital Astana is renowned for its futuristic and eclectic (or ostentatious and jumbled, depending on one's aesthetic) architecture. It also has a more dubious distinction: it's the second coldest capital city in the world. Other cities in northern Kazakhstan are just as chilly. With temperatures often below minus 30 Celsius, David Mould, who teaches media studies at Ohio University, had plenty of time to reflect on the coldest winter of his life during his Fulbright Fellowship in Kazakhstan. If you're looking for steady, seasonal work, try snow removal in Astana. Because it snows almost every day in January and February, the city clears snow almost every day. When it isn't snowing, city workers try to break up the six-inch layer of ice under the snow and sweep the sidewalks. It's an impressive operation. In some North American cities, snow piles up alongside roads and sidewalks. In Astana they literally remove it. Workers shovel snow and ice into front loaders that dump it into trucks that haul it out of town. I don't know where they put it, but if some poor farmer's field is still under snow in May, we'll have a clue. I've never lived in as harsh a climate, and it takes some adaptation. Astana is the second coldest capital city in the world (after Ulaan Baatar in Mongolia) but because it's the seat of government and the site of major international government conferences and sporting events, city services work pretty well. You would not want a visiting head of state or a star athlete to fall on the sidewalk outside the Hyatt, would you? That would be bad for the national image. Kazakhstan, still self-consciously trying to shake off associations from the movie Borat, is very concerned about how it looks to the rest of the world. Astana is really two cities. On the left bank of the River Ishim is the new metropolis with its architectural showpieces-the Pyramid of Peace and Reconciliation, the Ak Orda (White House) presidential palace, the tent-like Khan Shatyry city mall--designed by international architects. It's full of high-rise luxury apartments, government ministries, malls, parks and public squares. The wind blows hard off the steppe, funneling along the broad avenues and buffeting the few pedestrians brave enough to face the cold. On the right bank is the older city, which was named Tselinograd ("City of the Virgin Lands") in Soviet times and, after independence in 1991, Akmola ("White Way" in Kazakh) until it became the capital in 1998. The buildings-old Soviet apartment blocks (Khrushchevkas), newer apartments and some traditional single-story houses--are close together. There are markets, small shops and street kiosks. Maybe it's just psychological, but it feels warmer than the new city-or, at least, not as bone-chillingly cold. That's where I live. Even in the older city, walking can be hazardous to your health. The snow may be only a few inches deep but it is hard-packed. However, it's safer walking on the snow than on the sidewalk, which is often a pure sheet of ice. I go slowly, looking for patches of snow that will give me a firmer footing. The locals seem to be equipped with all-weather feet, walking briskly, some of the women in fashionable high heels. I'm learning snow-related Russian words, such as the descriptive skolski, which means slippery. When the snow melts, I suppose I will learn the mud-related words. My complaints about the winter usually fall on deaf ears. My regular taxi-driver Alexander tells me it's been mild. He recalls that when he was a child in a village in northern Kazakhstan, the snow reached almost to the roof (about three meters high) of the family's one-story home and they had to dig a passage through to the street. He said they never got too cold, because they had an ample wood supply and because the deep snow around the house had an igloo effect. It's a short walk from my apartment to a local coffee shop that doubles as an English-language library with books and DVDs. It also offers old newspapers and magazines donated by customers. You can learn that "Republicans Win Midterm U.S. Elections" in case you missed the story the first time around. I asked a British couple, Paul and Sarah, what they did for fun in Astana in winter. There was a brief silence. "Well, we often come here, have coffee, check out a DVD and go home and watch it," said Sarah. This was not encouraging news. I guess that if I get bored, there's always snow to clear. A disadvantage of living in a provincial city is that the local government lacks the resources of the capital. While the snow is cleared in Astana, in Semey, an industrial city with a population of about 300,000 in northeastern Kazakhstan, it just piles up. In Astana, city workers have modern snow ploughs and front loaders. In Semey, they have old Soviet trucks and shovels. They try to clear the main roads, but the side roads, even in the center of the city, don't get much attention. You are almost always walking on snow, over ice, over hard-packed snow. This makes the habit of holding onto your companion not only culturally acceptable but vital to personal safety. I've felt most secure when my two university colleagues, Galiya and Togzhan, are to my left and right, their arms locked in mine. On the two-hour flight from Astana, the snow-covered steppe gives way to forests of pine and fir. The city is just over 100 kilometers from the Russian border, close enough for a shopping trip (prices for basic foodstuffs are markedly higher in Russia). It was founded on the site of an ancient Kazakh fortress whose appearance-seven tent-shaped towers-gave the city its original (and Soviet) name of Semeipalitinsk (literally "seven tents"). 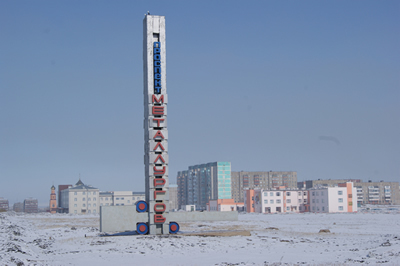 The city has always been an educational and cultural center, with museums dedicated to the country's most famous philosopher and poet, Abai, born near Semey in 1845, and to the Russian writer Dostoyevsky, who spent five years in exile here after his involvement in the political unrest of 1848. While the real estate boom in Astana has led to the demolition of many old, single-story houses, much of Semey's 19th century architecture survives. Just a few blocks from the city center, you enter a pre-Soviet world of narrow lanes and small, one and two-story log houses, some faced with stucco, with brightly painted windows and carved, ornamental woodwork. These are the traditional homes found throughout Siberian Russia and northern Central Asia, with logs cut from the great birch and fir forests. The warmest place in Semey is the traditional Russian bannya. In the sauna room, a large fire heats stones in a fireplace. Your companion (in my case, the city prosecutor) douses the stones with water, creating hot steam. As you lay on the bench, he beats you with the leaves of birch branches to help the steam circulate through your body. Then you either go roll in the snow-not recommended, because of pedestrians and traffic-or jump into a small pool. You eat horsemeat, chicken wings, nuts and fruit, drink vodka, play billiards and then do it all over again. It's a strictly all-male affair that can last for hours. By land area, Kazakhstan is the ninth largest country in the world with long distances between its population centers. Most people cannot afford to travel by air, so long-distance trains offer cheap, all-season travel. You don't get anywhere fast; trips lasting from one to four days are common. My first trip was a short one-just over 200 kilometers from Astana to the industrial and coal mining city of Karaganda, about 3 ½ hours by diesel train. Buses are faster, but the locals prefer train travel in the winter months because the road is often closed by snow or ice. It's a bleak landscape of coal tipples and abandoned factories, but the region is still the country's industrial heartland. The renovated Soviet-era steel plant at Temirtau ("Iron Mountain" in Kazakh), now owned by an Indian company, employs over 30,000 people making it the region's largest employer-and largest polluter. The final destination for my train was Zhezkazgan, another 20 hours southwest of Karaganda. Ten minutes after departure, the two attendants were busy distributing sheets, pillows and blankets to the passengers. On this Soviet-era train, there are no sleeping compartments-just sections with six lower and upper seats for beds, with mattresses. An hour out of Astana, some passengers were already asleep. Others were busy eating. You don't go on a train journey in Kazakhstan, especially in winter, without bringing food because many trains don't have a restaurant car. It's customary to share food with fellow passengers, so on the return trip the couple sitting opposite me offered me tea, sausage and cookies. Hot water for tea and soup comes from a cistern heated by a coal stove. Indeed, the whole car was heated by coal. One of the jobs of the attendants is to pick up buckets of coal at stations and keep the furnace (and the hot water stove) supplied and stoked. Half an hour out of Astana on the train, Valery had already opened the first bottle of cognac and was figuring out how much alcohol we would need for the 15-hour overnight trip to Kostanai. It was only 4:30 p.m. and, with several hours of daylight left, I wanted to look out the window at the steppe, not drink. But you have to be sociable, so I agreed to one glass, then a second and a third. An hour later, I escaped and hung out in the corridor for two hours before returning to the compartment. Valery, his friend Igor and the third passenger were already almost through bottle number two, and had bought a bottle of vodka from the drinks trolley. They serve small glasses of vodka and cognac in the restaurant car, but for those who want to drink in the compartment, a vendor plies the corridors selling bottles. Sensibly, Valery and Igor were also eating-dark bread, cheese, sausage, piroshky and strong Russian mustard. Valery slapped some mustard on a slice of bread and passed it to me. It almost blew my head off and definitely cleared out my nostrils. "Good for your health-you won't get a cold," Valery laughed as I gasped and turned red. "Here, have more vodka." As the evening wore on and the alcohol took its toll, the conversation got more animated and difficult to understand. Valery and Igor were on their way to Kostanai oblast (province) for a hunting and fishing trip. I must have skipped the chapter on winter outdoor sports in the Intermediate Russian textbook, so there was a lot of extending of arms and simulated gunshot noises as virtual ducks fell to earth. By 10:00 p.m., everyone had settled down for the night. Then the snoring started. It didn't bother me while we were moving because the sound of the train drowned it out, but it woke me up when we stopped at stations-as we did four or five times after midnight. At 3:00 a.m. at an isolated town on the frozen steppe, there's no traffic and no people. Only snoring. At 6:00 a.m., the attendants knocked on the doors to tell passengers we'd be arriving in Kostanai city in an hour. Valery swung down from the top bunk, opened a bottle of beer and offered me another. I refused. He smiled. "Now you know kak Russkiye zhivut (how Russians live)," he said. I wanted to say that I hoped not all Russians lived that way, but I recognized the sincerity of the hospitality. It was another warm memory of a cold Kazakhstan winter. Temirtau, the city of steel. © Photo by David Mould.